By early 1945, Nazi forces in Europe were in retreat, pursued by the Americans and British from the West and Soviet forces from the east. Areas occupied by the Nazis since 1940-41 now found themselves liberated. 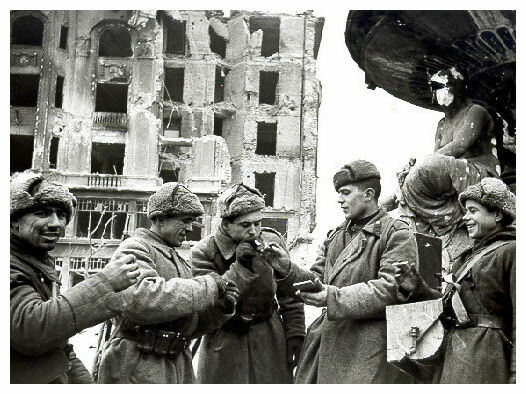 Nations in eastern Europe – Poland, Czechoslovakia, Hungary, Romania and Bulgaria – were liberated by the Soviet Red Army. Post-war, the Soviets remained in these countries longer than expected and longer than necessary. They had work to do, as agents worked behind the scenes to ‘sovietise’ these countries – in other words, to leave each of them with a puppet government to serve as an extension of the Kremlin. These regimes had the appearance of democratic and representative governments but, in reality, they were neither. In most cases, local communists were gathered into a coalition party then given power, usually following a coup or rigged election. Soviet agents were appointed as ‘advisors’ but were in fact monitors, informers and enforcers. Other political parties were dissolved and dissenters and resisters were sidelined or eliminated. By the late 1940s, most of eastern Europe was cloaked behind what became known as the Iron Curtain. The announcement of the Marshall Plan by the Americans in mid-1947 revealed the extent that these nations were under Stalin’s control. All six members of the Eastern Bloc refused invitations to the Paris negotiation conference, despite Poland and Czechoslovakia having earlier expressed some interest in accepting US aid. Moscow’s control of Eastern Bloc governments became less covert after this. In September 1947 the USSR established Cominform (the Communist Information Bureau) which linked the communist governments of eastern Europe and ensured they adopted policies approved by Moscow. Several Czechoslovak, Romanian, Hungarian and Bulgarian communists who failed to toe the line were reported by Cominform, arrested, given Stalinist ‘show trials’ then executed. 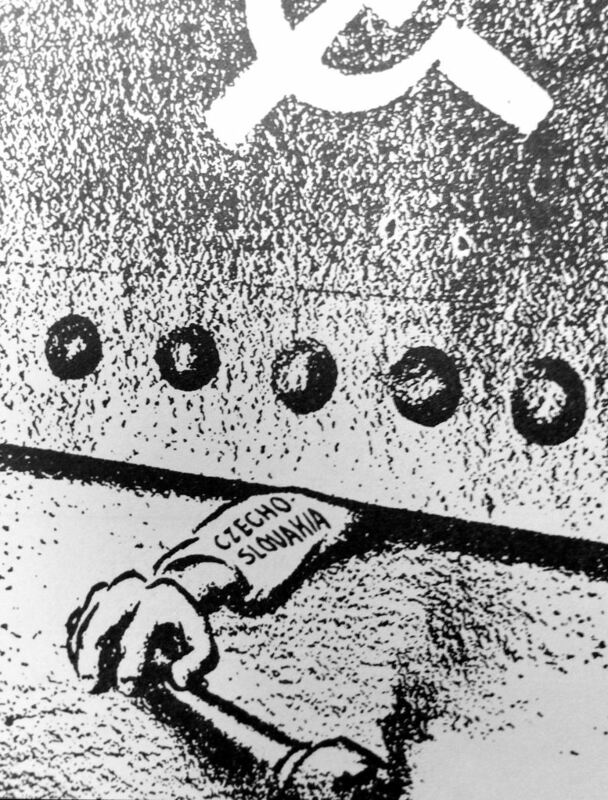 Each Eastern Bloc government formed its own secret police based on the Soviet NKVD, including the Stasi (East Germany) Securitate (Romania) the StB (Czechoslovakia) the Sigurnost (Bulgaria) and the AVH (Hungary). Any pretence that these countries were independent or discrete from the USSR had faded away by the early 1950s. For those living in Soviet bloc nations, it became gradually more difficult to relocate or travel to other countries. Borders once relatively open became guarded and tightly controlled. Europe’s border controls, once relatively relaxed, became the strictest in its peacetime history. This division was keenly felt in Germany, which was split asunder by Soviet and Allied occupation zones. The twin towns of Sonnerberg and Neustadt found themselves in the Soviet and Allied zones respectively and separated by the Iron Curtain. In July 1949 the two towns participated in a soccer game, played on a pitch with a boundary-line formed by the east-west border (allowing those on both sides to watch the match without passes). More than 25,000 spectators attended, some holding up placards demanding the two towns – and indeed the entire German nation – be reunified. After the match, Soviet officials opened the border for the afternoon, allowing thousands of Sonnerberg residents to visit family and friends and shop at Neustadt’s well-stocked businesses. Optimistic events like east-west football matches and border openings provided some hope that the borders would one day be relaxed or dissolved. But as pro-Moscow governments settled into power in the east, they began to strengthen border controls – to lock out anti-communist infiltrators and demonstrators, as well as preventing an exodus of their own people to the West. In 1951 East Germany began a building program to fortify vulnerable parts of its border, erecting barbed wire, towers, gates and guard posts. Some heavily populated areas fringing the border were cleared of people. Roads, railways and tunnels crossing borders were destroyed, dug up or diverted. The ground near the border was cleared and, in some cases, packed with landmines. In 1949, it had been possible to cross the border into Allied-occupied Germany, if one was determined enough. Within four years, the border was sealed, government-authorised crossings were strictly controlled and unauthorised crossings were dangerous. The Iron Curtain was not only a political and philosophical concept; it was a real and tangible one. 1. The Iron Curtain was a Cold War name for the borders between Western and Soviet Europe. 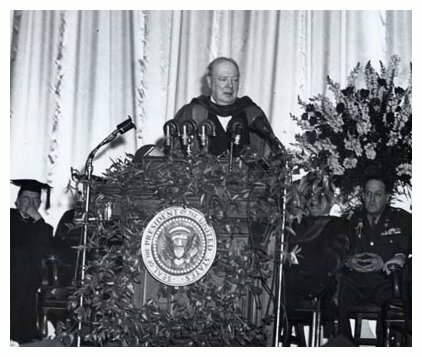 It was coined by Winston Churchill in 1946 during a speech in Fulton, Missouri. 2. The formation of a Soviet bloc in Europe occurred after World War II. After the Soviets liberated eastern European nations from Nazism, they shaped the political development of these nations. 3. In most cases, Soviet agents orchestrated a pro-Soviet government by organising local socialists in a party or coalition, then giving them power through a coup or rigged election. 4. The implementation of the Marshall Plan further exposed the widening divisions between these two blocs, with Soviet bloc nations refusing this aid under directions from Moscow. 5. The prohibition of movement and trade, along with the growth of secret police forces in the Soviet bloc, saw the Iron Curtain firm into an uncrossable border by the early 1950s. J. Llewellyn & S. Thompson, “The Iron Curtain”, Alpha History, accessed [today’s date], https://alphahistory.com/coldwar/iron-curtain/.